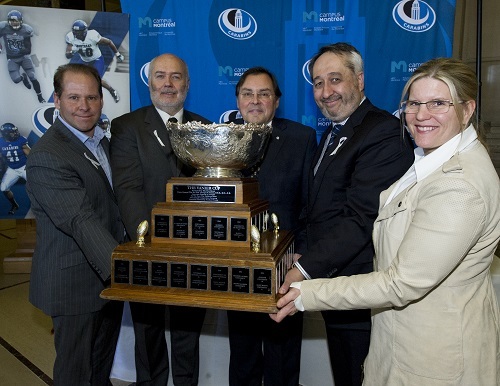 News > 2014 > Vanier Cup: Congratulations to the 17 HEC Montréal students who contributed to the Carabins’ historic victory! The Université de Montréal Carabins wrote a new page in football history by taking the 50th Vanier Cup, the ultimate trophy in Canadian university football, on their first appearance in the national finals. And 17 HEC Montréal students contributed to the 20-19 victory against the McMaster Marauders, in a game played for the first time in Montreal. This was the third Canadian Interuniversity Sports (CIS) championship in the Carabins’ history, after winning men’s volleyball in 1970 and women’s hockey in 2013. It also makes the Bleus the third team in CIS history to take the Vanier Cup final in its home town, after the Toronto Varsity Blues (1993) and the Laval Rouge et Or (2010 and 2013). It’s a wonderful way for the Carabins football team to wind up their season after their longest run of wins ever, as they emerged triumphant in their last 11 games. Source: Université de Montréal Carabins. Danny Maciocia, Carabins Head Coach, Christophe Guy, CEO of Polytechnique, Guy Breton, University de Montréal Rector, Michel Patry, HEC Montréal Director, Manon Simard, Université de Montréal Athletic Director, during the December 2nd press conference.